While doing research for One Soul to Share, a romance novella about a mermaid and a vampire, I discovered a lot about mermaids–mainly that they got a raw deal. This may be surprising. Mermaids are beautiful. They have gorgeous hair and voices that make men weep. They are free and the picture of joy in the water. But somehow with all of that, for the most part their stories didn’t seem to end all that well. 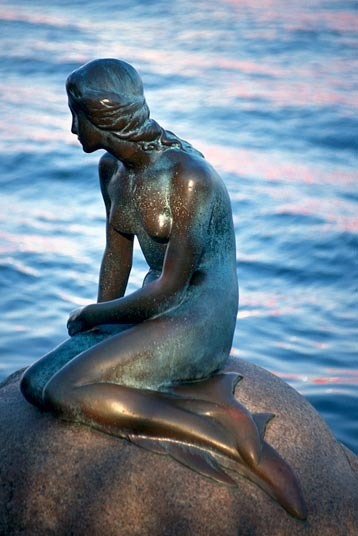 Take for example the mermaid in the original Hans Christian Andersen story The Little Mermaid. She falls in love with a prince, but he chooses another woman over her. The mermaid is given the choice of stabbing the prince and returning to her original mermaid state or dying herself. She chooses her own demise. A noble choice, don’t you think? And how is she rewarded? She becomes a “daughter of the air” with 300 years of serving humanity ahead of her to earn a soul, because apparently sacrificing her own life wasn’t enough. Uh… This did not leaving me cheering. Then there is the poor Ceasg, a Scottish Highlands mermaid who, like the heroine of One Soul to Share, has a soul that is separate from her body. She is also beautiful and has the ability to grant three wishes if captured. Guess what that means? No sweet little courtship for her. Then there is Liban. She’s called the “sanctified mermaid,” and is pictured in old Christian carvings. Liban’s story starts with tragedy. When she was a human girl, a sacred spring she lived near flooded. The waters swept away her entire family, even her dog. Liban prayed to survive and was transformed from the waist down into a salmon. Her dog became an otter. Much later she was captured. Now you might think why capture her? She was after all an obvious victim in this story, but apparently her half-fish state meant she was, at least in the eyes of the fishermen who caught her, soulless. However, being kind and gentle men they offered her a choice. She could be baptized to regain her soul or just be put to death on the spot. She chose the soul. And then what? Well, she died anyway. With stories like this, is it any wonder the Loreleis choose to stay on their rock and sing rather than jumping into the ocean and saving the fools who crash into their isle? I mean what would their reward have been? Probably a rock tied to their tale and eternity gurgling away at the bottom of the sea. What do you think? Did mermaids get a raw deal? If so, why do you think that is? Serious raw deal. I’d actually only heard about The Little Mermaid, but the other stories are just as tragic. I wonder why? Yes, we need a happy mermaid story! I recently read the original Hans Christian Andersen story and cringed! A raw deal indeed. 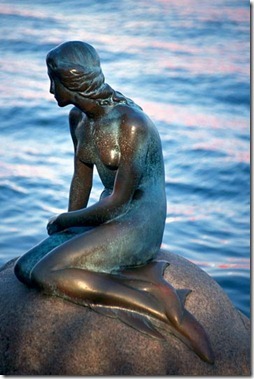 My middle name Pania is named after a Maori(indigenous people of New Zealand) mythical mermaid! And I too have a tragic love story… I met a young men when I was young, we fell inlove, he broke up with me, I didnt understand why. I set myself on a road to self destruction from then on but could not forget him, even though I married to try to move on. My marriage was unhappy, my husband didnt appreciate me, it wasnt true love, he wasnt inlove with me. I was still inlove with the other young man even though I tried to forget him, he was always with another woman even if it wasnt the same woman, he never married. Strangely we bumped into each other a few times over the years and the feelings were the same although he was always with other woman at those times. He had children to these other woman but not happy and not loyal. He contacted me 4-5yrs ago the first time, we txtd, said he wanted to see me then ends up with his x again. Again a yr or so later he contacts me, same thing then ends up with his x coz I told him my husband was with me. Me and my husband have always been on and off because I would always leave coz he was bad to me but he would always come back and I would always take him back but he would always be bad to me again etc etc. The young man I was inlove with went straight back to his x, she gets pregnant. A yr or so later he contacts me again, he and his girlfriend have separated again and wants to see me then his x is pregnant again so he tells me ….4 children later to different woman, he is going back to her and I’ll never hear from him again. This was a few months ago and he is expecting a child to be born any month now. I believe he still has feelings for me as he has always told me I was special to him and he has missed me and cant forget me either… but yet he always chooses other woman. I am heart broken by two men. I got the raw deal and I am loving and caring and kind. Men are always attracted to me but still I am alone and lonely coz I have separated with my husband as he is no good for me. I am Renee Pania, named after the mermaid Pania from a Maori myth in New Zealand. What will become of me and will I ever have true love or am I doomed to a life of heart break and loneliness like all the other mermaids?